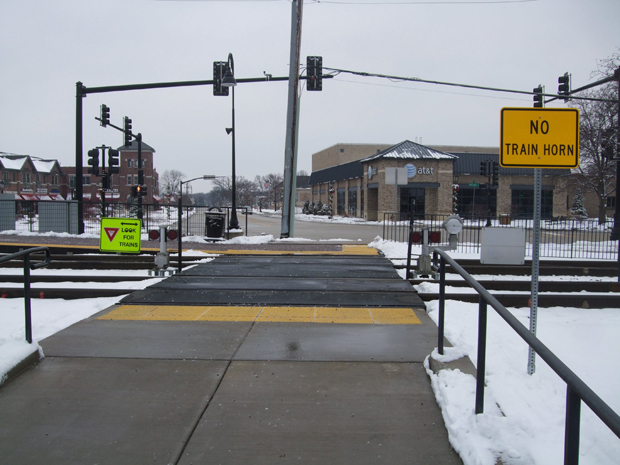 Signage at Metra's Bartlett station on the Milwaukee District/West Line route indicates safety precautions for pedestrians crossing the tracks. Frequent commuters are all too familiar with the pangs of delays: the groans induced by announcements made over a train intercom, or the confusion created when train or bus operators suggest alternative routes, thanks (or no thanks) to weather, mechanical failures, or backups. Chicago-area Metra riders are no strangers to these feelings, but often these delays are brought on by another, more heart-dropping reason: pedestrian accidents and fatalities. It’s not uncommon for up to 1,300 Metra riders to be held on a train for more than an hour while investigators gather at the scene to determine what happened. How can a thorough investigation of Metra fatalities be performed when trains are up and running 90 minutes after a fatality? It’s a bit of a loaded question, of course, as our questioner is basically asking whether a 90-minute timeframe is sufficient to gather evidence. From the first moment we spoke with the questioner, we knew this would be sensitive topic, for sure, but experts did make themselves available to explain how pedestrian death investigations work, and they were also willing to address the “90 minutes” figure directly. And the question’s important, too. 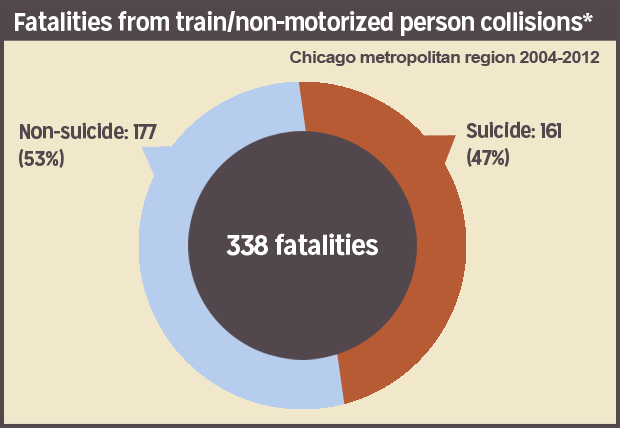 The issue of pedestrian fatalities by train is regularly in the Chicago-area news. Also, anyone involved — a victim&apos;s family, commuters on the train, taxpayers in Illinois — deserves to know exactly what’s going on outside that train once tragedy strikes. Pedestrian fatalities by Metra trains, or any type of train, for that matter, are not new phenomena. Train deaths, both intentional and accidental, have been an issue for rail officials across the world. But as Northwestern University researcher Ian Savage found out, these incidents are happening in Illinois more than any other place in the United States. According to Savage, one of the main reasons is Chicago’s position as a national rail hub. Savage looked at data from the Illinois Commerce Commission from 2004 to 2012, and accounted for 338 pedestrian deaths by train within the six-county Chicago area. (Notably, Savage’s research did not include the Chicago Transit Authority’s elevated trains). Put another way, the area saw one pedestrian death by train every 10 days. Approximately 47 percent of the incidents were suicides. According to Savage, these fatalities happen for a variety of reasons. When it comes to accidents, many times people don’t understand how dangerous trains really are. “In some cases, crossings are designed in a way that good people are lead into making bad decisions. And I think that perceptions of speed are very difficult,” he said. And while the complexity of suicide makes it difficult to understand the reasoning behind individual deaths, Savage said the frequency and high number of occurrences is likely connected to the availability of trains around Chicago. Through his research, Savage stumbled on a study from Children’s Memorial Hospital that looked at methods of suicide. They found that the use of trains in the Chicago area was more than four times the national average. Konczal said every investigation begins the same way: A dispatcher is immediately notified of anything that happens on Metra railroads or that involves a Metra train. That dispatcher then notifies a control center, which reaches out to the municipality where the incident occurred. The local municipality usually arrives on the scene first because of their close proximity. They’ll secure the scene, meet with the train crew, and begin to gather witness testimony. 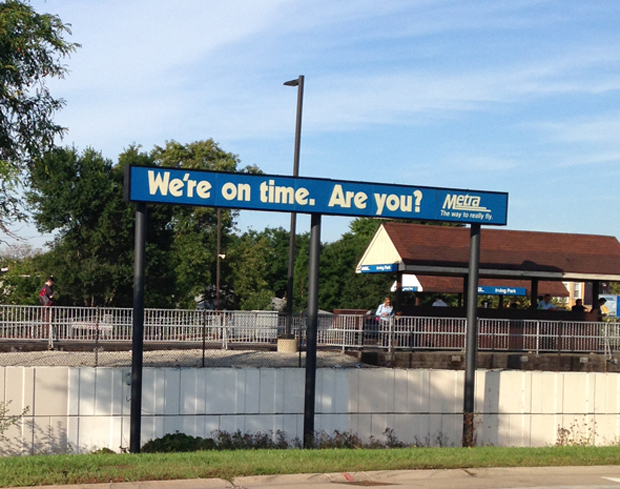 Metra also has its own police force. Its officers do their best to get to the scene ASAP, but it could take some time, as the six-county service area is about the size of Connecticut. Once both departments are on scene, one will take the lead. Metra rail lines cover six counties and more than 110 municipalities. The service area is about the size of the state of Connecticut, which means travel times for investigators and other responders can be sizable. “Usually, if Metra police investigate the incident, we can do it a little quicker. We have evidence technicians on scene 24 hours [per day], and a lot of times local municipality doesn&apos;t have that. They have to call them in, so that may add time to investigation,” Konczal said. But depending on the type of accident, and how long it takes to gather all the correct people together, investigations can still take a while. Konczal said if Metra strikes a vehicle, federal regulations require that signals be tested, for example. In a fatality situation, officials have to report information to the ICC and the Federal Railroad Administration. Almost all Metra trains have cameras on them now, as do some grade crossings, so film has to be reviewed to determine what happened, and to assess whether it was an intentional death or not. They also have to wait for a coroner to arrive, as he or she has to respectfully remove the remains. The Metra Police Department was recently assessed by Hillard Heintze, an independent council of retired police chiefs. While the group found many issues with the department overall (e.g., unclear mission, ineffective or nonexistent policies and procedures, staffing issues, etc.) 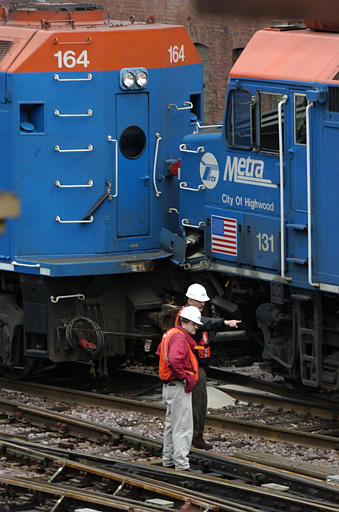 the report did not address how Metra conducts fatality investigations. Metra officials say there’s no minimum or maximum amount of time that they try and meet for each investigation. Other police departments operate this way as well. Bond said each investigation varies tremendously, depending on the incident: It could be hours, or it could be one hour. But what doesn’t change per incident, according to Metra officials and police, is the difficulty of dealing with these fatalities, both for him and his staff. Naperville Police Chief Bob Marshall said his department, like many others around the state, provides mental health services for any officer that responds to traumatic events. Naperville recently dealt with two suicides by train. Metra, as well as local law enforcement agencies, suggest that some investigations can take far less than the 90-minute figure that started our look into train-related pedestrian deaths. According to Joe Schwieterman, transportation professor at DePaul University (and Metra rider for 23 years), delays of any kind can be difficult to bear. “You feel the tension on board right away, people start making phone calls, and after five or ten minutes, you know, you start to wonder, ‘Is this gonna be a nightmare?’ So that speculation starts,” he said. According to Schweiterman, everyone in the region has been startled by how a fairly small commuter rail system (in the national sense) has such a regular pattern of hitting people. And a lot of it, he said, isn’t on Metra. But when it comes to whether these investigations are long enough or comprehensive enough, Schwieterman said anything longer than the current delays wouldn’t be practical.